We all love to barbecue but how many of us really know much about the fuel we’re using? Apart from doing your best to light it quickly and hope you’ve lit enough for the cook your about to do! 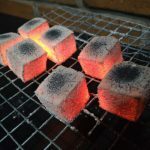 Most people have heard of the main BBQ charcoal terms, briquettes and lump, but do you really know the difference? And why should you care? If our 20 years in the business of producing BBQ Charcoal has taught us anything, it’s to be educated about the product you buy and the fuel that is going under and around the food you are about to eat! So here’s the low-down for you, the difference between briquette charcoal and hardwood lump for the BBQ. Briquette fuel is charcoal that has been given a shape or a form. e.g hexagonal logs, pillow shaped beads. Both are a manufactured product that use a by-product as its main raw material. Examples of by-products used are sawdust, brown coal, coconut shell and bamboo. Briquettes, for the most part are manufactured with a binding agent unless it’s a sawdust based product like our Firebrand briquettes which has zero binding agents or chemical additives. 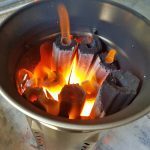 In the case of sawdust BBQ briquette charcoal, the manufacturing process uses heat and pressure activate the natural resin found in the make up of the raw material which essentially acts as a glue to bind the sawdust together producing bio logs. This then goes through a carbonisation process resulting in a pure carbon end product. In non-sawdust briquettes, most of the time, the binders in the manufacturing process are food grade and safe to use. However, some briquette charcoal in the market is unfortunately manufactured with potentially hazardous binding agents which usually emit a foul odour on lighting. If you come across these types of briquettes (no matter what shape) steer clear. Natural Hardwood Lump Charcoal is sourced directly from the tree using the branches, trunk and in some cases even the roots. This BBQ fuel still goes through a carbonisation process which burns out impurities and gives it its carbon form to be used in BBQ. You will often find inconsistent sizes of the lump in each bag because it’s a natural product. Branches and trunks naturally have different densities and come out in different sizes. Out of one kiln production, pieces range from marble size to soccer ball size. They are then screened, shaken through a predetermined mesh, to generally remove sizes smaller than about 40mm and the rest is bagged. In addition, there is a settling that occurs during handling and transit of bags which can also affect the resulting size of pieces in a single bag and amount of sediment. Natural hardwood lump lights quickly (quicker than briquettes) will give you reasonably high heat and lasting time depending on the species of hardwood and size of the pieces. The harder the character of the wood species the more heavy duty charcoal result after carbonisaton which means a higher heat output and lasting time. 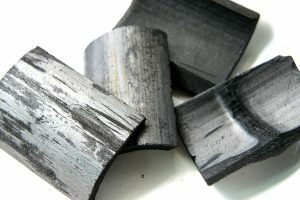 For example, wood from stone fruits would be considered a soft-wood versus a QLD Ironbark which is a harder raw material resulting in a harder charcoal product. 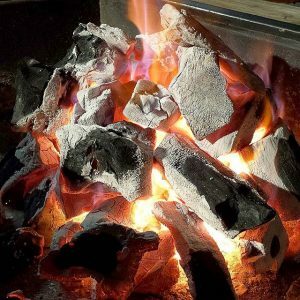 Briquettes being denser, take longer to light however the lasting time and heat will generally be higher and longer than any hardwood charcoal if the raw material is of good quality. Firebrand briquettes, for example, burn at 7,800+ CV (calorific value – a world measure of heat level.) Versus the average pillow shaped bead product which will generally not exceed 5,000 CV. 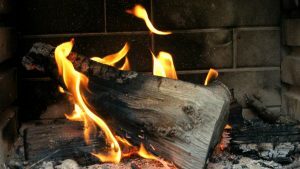 Sawdust based briquettes will almost always give you a prolonged burn time compared to other briquettes or hardwood lump. Softwood lump hits 5,000 CV comfortably but a good hardwood lump produced from a premium raw material will burn between 6,500 – 7,000CV such as Firebrand Hardwood Lump products. 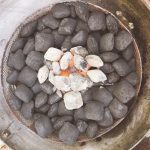 When to use Briquette and when to use Lump? It does come down to personal preference as both forms of charcoal can fuel almost all charcoal BBQ cooking units. Whether they are open grills, kettle BBQs, rotisseries or smokers. Due to the longer burn time of the briquettes, they are often great for open based applications such as rotisseries or general grilling which will give a solid 3-5 hours of cook time. However, in a controlled smoking environment, hardwood lump can also perform for hours at a time. Some people prefer the all-natural hardwood product as it is less manufactured and has no binders like some of the equivalent briquette charcoal on the market. As a more natural product, it allows BBQr’s to then flavour the cook with other smoking woods, for example, chips or chunks in Apple, Cherry and Pecan. Many people like to mix the two, and quite often a layer of hardwood lump at the base of a charcoal starter with briquettes on top, help the lighting process get going a lot quicker. Whichever way you go, the take away is to be educated about what you’re buying. Read the labels and make the choice that best suits you. Ready to buy? Click here to our fuel page. 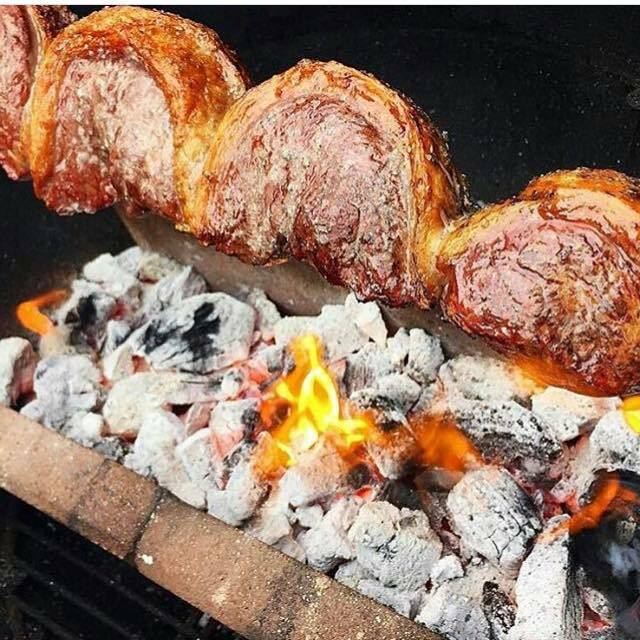 This entry was posted in BBQ Blog - all, BBQ Tips and tagged bbq, bbq charcoal, briquette, hardwood lump, lump charcoal.